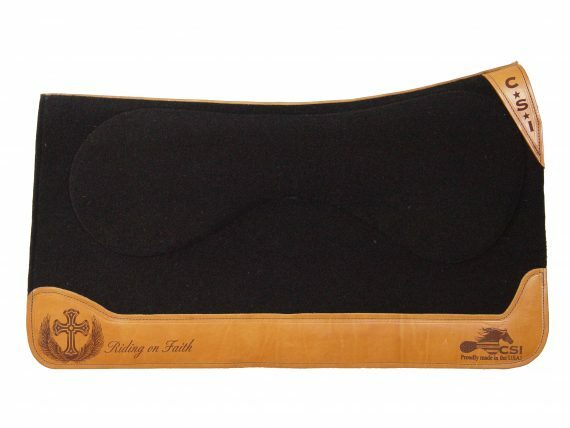 The standard or square CSI Saddle Pad is the go-to pad for most riders. It is the most versatile pad in our line-up and it will work with almost any saddle. Available in 32″ and 30″ lengths. ALL CSI SADDLEPADS ARE HANDMADE INDIVIDUALLY SO MEASUREMENTS MAY VARY! Click on the “select options” below to see the options available for our standard pads. CSI Saddle Pads offers you some amazing custom looks with our Standard CSI Saddle Pad. Call the shop to ask about a custom order: 877-274-7230. Show your style with a laser engraved CSI Saddle Pad. Choose from one of our standard options or have your initials, brand or logo lasered onto your saddle pad. Great for trophy, award and gift saddle pads. Tooled wear leathers are a beautiful upgrade to your CSI Saddle Pad. You can choose from several standard tooled options on high grade, thick leather. Hair-on cowhide inlays make for a beautiful custom saddle pad that is truly unique. Because each hide differs, your saddle pad will be one-of-a-kind. Available in brindle, tricolor, brown/white and black/white. Show some flare and even add a pop of color with an exotic hide inlay. You can choose from a variety of hides and types including Croc, Ostrich and Floral embossing. The Show Cut CSI Saddle Pad has a smaller footprint and is lighter weight than the Standard CSI Saddle Pad. This makes it concealable under a show blanket. Whether you’re a barrel racer who wants to show off some bling by using a colorful Navajo or a Western Pleasure rider who wants to use a matching show blanket over your CSI pad, the Show Cut pad is the solution you’ve been seeking. You can also ride the pad without covering it up, just like Sarah McDonald and Bling! Available in 30″ and 32″ lengths. Click on the “select options” below to see the options available for our show cut pads. The Round Skirt CSI Saddle Pad is a favorite of gaited horse riders because it beautifully fits under gaited horse saddles and trail saddles including Tucker saddles. This pad is also perfect for barrel racers and any one else who uses minimal or round skirt saddles. Click on the “select options” below to see the options available for our round skirt pads. The Sport Cut CSI Saddle Pad is designed to work with crossover gaited horse saddles, treeless saddles and sport type saddles. 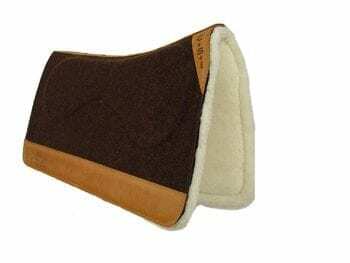 If you are using a treeless saddle with this pad, you will want to choose a 32″ length regardless of your saddle skirt size so the contour of your saddle and the CSI Pad will work together well. All other saddle types will benefit from a 30″ Sport Cut unless your saddle skirt is more than 30″ at its longest point. Click on the “select options” below to see the options available for our sport cut pads. 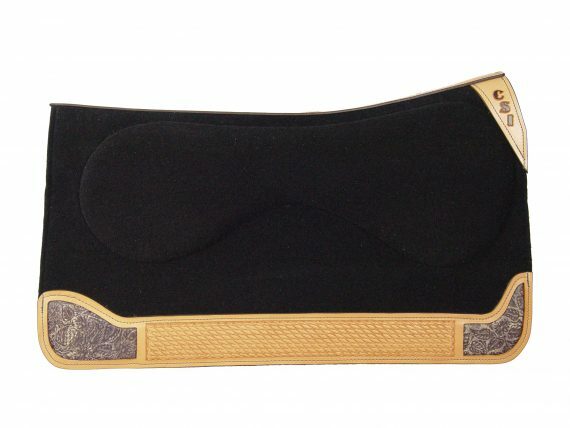 CSI Saddle Pad liners are removable, reversible and replaceable. They are made of 100% All-Natural Needled Wool and come in 3/4″ and 1/2″ thicknesses. About 85% of our customers find a 3/4″ liner works best. It provides the most protection and offers the best shock absorbing benefit. It is perfect for general and intense riding including training, ranch, rodeo, trail, pleasure, and performance. If your horse is mutton withered or your saddle has a narrow gullet, then you should choose a 1/2″ liner.